- All power is provided by the engine. No plugs! Gasoline Engine: - 13 HP - Electric Start! Dimensions: 60 x 26 x 39"
High Pressure Solution - Hot Soap Injection! OMP Stands for Oil heated Motor Pumped the C stands for full Combination wash system. Jenny invented the worlds First Steam Cleaner, back in 1927! Todays systems are multi function. Its a Hot Water High Pressure Washer, Cold Water High Pressure Washers & a high volume Wet Steam Cleaner! Featuring max outputs of up to 3000 PSI (depending upon model below) @ 140° F hot water, cold water High Pressure, or up to 200 PSI of 325° F wet steam all in one machine! The Gasoline Engine means you can fire it up almost anywhere! All systems in this class feature a 50 foot long hose and industrial 5' pressure wand, Hot Chemical /Soap Injection and low flow, super heated wet steam mode up to 325° F. All feature 5 quick connect spray pattern tips to cover a range of jobs. Tips are quick disconnect and store right on the side of the unit. We have units from 750 PSI up to 3500 PSI with various water flow rates. This is no toy! Units weigh around 450+ lbs depending upon model. Clearly these are super duty machines. 100% American made, and might I add, done with pride. If you don't mind a some water, then these are the best of the best, the cream of the crop. The fact that you can switch between high pressure cold water, hot water and wet steam as well as inject soap in any mode makes the C series a winner. 3 Machines in one! See optional configurations below. More Power = faster cleaning & rinsing. Want even more? We have units up to a massive 3000 PSI and 10 GPM! Call for more information! The 2040-C and the 3040-C below are our top two recommendations for the car wash business. Great on boats, cars, trucks, air craft, tractors, equipment, pavement and more. Have a Question? Want to Order? + Hot Soap Injection in ALL Modes! Gasoline Engine: - 11 HP - Electric Start! "What I Like about This"
One of the most amazing features of the OMP (Oil Motor Powered) class Steam Jenny's listed above are their 4 modes of operation. Cold water pressure washers are a dime a dozen. Hot water pressure washers are very expensive but limit you to only hot or cold water. Our world class systems offer 4 modes of operation in ONE unit. Want to sanitize an area or blast away thick grease? No problem, just pop into steam mode and watch the 325 degree super heated steam melt away the grime at 200 PSI. Want more pressure? Instantly switch to hot water mode at pressures up to 3,000 PSI with temps of 140 degrees F. Don't want heat? Instantly switch to cold water, high pressure mode. If that was not enough, you can drop the suction hose into a bucket or gallon of your favorite detergent IN ANY MODE! Hot water, steam and even high pressure cold water is fantastic but add a little soap and you have one amazing cleaning tool. Four machines in one, awesome! What really love about these units is how easy they are to use. Simply push a button to turn it on, and grab your gun and get to work! Heat up time from ice cold to ready to work is only a few short minutes. Once running the massive diesel heating core keeps things blazing hot for as long as you need it! There is only one thing you need to make this baby run and that's water. Simple! You can connect your water through standard garden hose. So, if you have a water supply, you can work in the middle of a corn field, parking lot or on Mars for that matter. This portability allows you to put this unit on a trailer or in the back of a truck. You can pull up to a job location and connect to their water supply (garden hose) and get to work. You can also purchase mobile water tanks for your trailer or truck and be truly 100% independent. I also love the 50 foot long high pressure steam hose! FIFTY FEET! Wet steam really holds its heat and with that, we can offer you these fantastic hose lengths. If you like, you can purchase a second quick connect, 50 foot hose and add it to yours making an amazing 100 foot reach! That is sure to reach all of your car wash bay, loading dock, dumpster area or job site. Beautifully designed, this large creature has a low profile and is designed to roll right through any standard door way! Thats right, you can roll it right into your shop through the door. Getting to cold out? Is it closing time? Just roll it into your shop and put it away. All the Jenny Systems are push button operation. Depending upon what unit you have you just fuel up, attach your water supply, typically a garden hose, and push the ON button to turn it on! More: Fill the heating fuel tank with the specified fuel, typically Kerosene, Diesel or #2 Home Heating Oil. Now connect your steam/pressure hose and nozzle. Next, turn your Jenny on. For cold water press the appropriate button. Pull the trigger on the wand to begin cleaning. For high pressure hot water cleaning up to 140° F simply flip on the heater switch on and begin cleaning. For super heated wet steam and sanitizing cleaning at 325° F. simply clip on the quick connect steam tip on your gun and flip the switch on the unit to the steam mode! It couldn't be easier. The operation is very simple and the unit is very user friendly. Most units also come with 5 quick connect tips providing you with multiple spray patterns! COMPLETE MANUAL INCLUDED! 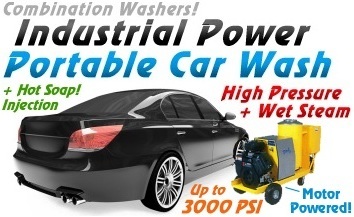 There are thousands of potential uses for these powerful industrial and full commercial wet steam cleaners and hot water pressure washing systems. The Car Wash Industry is ideal for these high volume machines. Also great fro degreasing, cleaning & sanitizing in and of factories, food processing plants, heavy equipment, trucks, trains, cement, loading docks, gas stations, oil rigs, oil fields, decks, driveways, removing ice damming on roofs, brick, glass, buildings, dumpsters, air craft, thawing iced surfaces, military, tanks, trucks, jeeps, jets, and so much more. Anywhere fast, sanitary, grease busting, dependable cleaning is needed! Units also available in ALL electric for clean air, 100% environmentally friendly, zero emission indoor use! Weather your a contract cleaner or part of the crew. 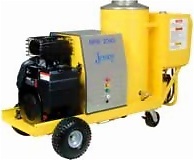 Steam Jenny Industrial pressure washing systems can fit the bill.